Quad canes are walking canes that have bases that are quite different to more traditional canes. Instead of ending in a single point, these walking canes have a four-pronged base. Each foot on this base is capped off with rubber tips. 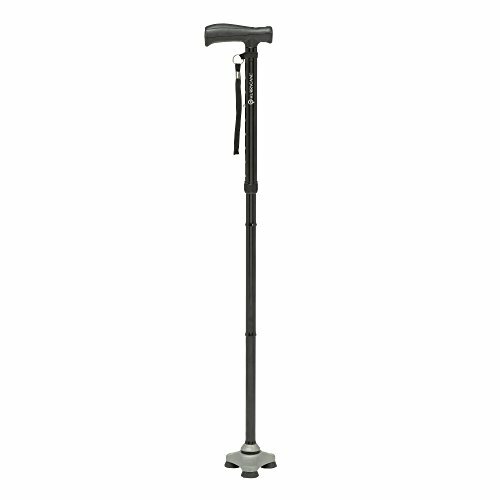 These walking canes are typically recommended to individuals who require an increased amount of support and stability. There are several reasons why someone might be asked to use a quad walking cane. 1. The most common reason is if someone is particularly unsteady on their feet. As this type of walking cane has four points of contact with the ground, it provides a greater amount of stability. Therefore, it allows people who are quite frail to gain a little bit more independence. 2. Some of the scenarios in which individuals might be prescribed such a cane is when they are recovering from a stroke. Depending on the severity of the stroke it is quite common to have to overcome weakness as well as the imbalance. In such an instance, this cane comes in quite handy. Those who are regaining their strength after hip replacement surgery tend to benefit from using this type of cane as well. In essence, there are many cases in which a doctor, surgeon, or physiotherapist may decide that a quad cane would be quite useful. 3. Oftentimes, individuals who are overweight are also instructed to use this type of walking cane. This is because it is quite efficient at being able to take a greater amount of pressure. This, again, is due to the base which allows for the weight to be distributed equally. As such, those who have issues with their weight might find it easier and safer to walk with this cane. 4. 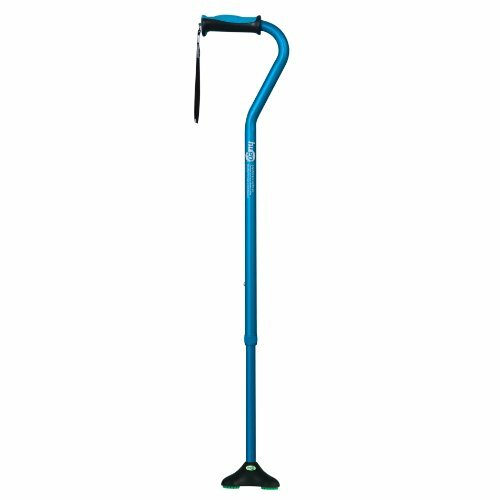 Last but not least, these canes have been proven to be quite helpful when it comes to rough or uncertain terrain. For instance, if someone tends to walk on uneven surfaces or the ground, they may find greater reliability with the four-footed base. It can be used outdoors as well as indoors to ensure steadiness. Quad canes are equipped with one of two types of bases. They either have narrow bases or wide bases. A doctor or physical therapist will determine which type of cane is best, depending on just how strong and stable a patient is. If the individual has only minimal problems when moving about, then a narrow base may be prescribed. In particular, if someone tends to have a little strength, they are usually relegated to a narrow-based cane. If the physical problems are a little more severe, then doctors may feel that a wide base is better for the person in question. One of the issues may be that the person does not have a great deal of strength in their limbs. Or, they may find it difficult to walk steadily without considerable support. A medical expert will be the best determinant regarding which base to use. Quad canes are typically made of stainless steel. This material is ideal for being able to withstand and undergo great amounts of pressure. Therefore, those using stainless steel walking canes can comfortably settle their weight onto the cane. Furthermore, this type of material is often resistant to corrosion and other types of damage. This makes it perfect for different types of uses, weather, and terrain. It is also much more likely to last a longer period of time. For certain canes, the base might be made of a different material than the shaft. If the cane is designed to be a little more durable, it may consist of a chrome plated steel base. More often than not, the shaft and base are made of the same substance. There are several instances in which these types of walking canes do differ, however. One of these is with the amount of weight that each cane is capable of safely supporting. As mentioned, these canes are quite good at being able to take more weight. Nonetheless, there are some canes that are better at this than others. For the most part, however, most quad canes are able to support about 250 pounds to about 300 pounds of weight. There are ones that have been specially designed for individuals battling obesity or other weight-related issues. These are capable of taking between 500 pounds to 700 pounds of weight. Prior to purchasing one of these canes, it is important to see just how to weight each cane is capable of taking. As with most walking canes, the shafts of quad canes can easily be adjusted. This is often done with the push of a button. There are discrepancies between how much each of these canes can be adjusted, nonetheless. In most instances, the canes can be used by individuals who range in heights from 5’0 to about 6’3. For individuals who are a little shorter or taller than most people will have to look for specially customized canes. These, too, can be easily located in most physical or online stores. The final area of comparison is the handle. First, handles tend to differ in the type of material that they are composed of. The ones that are most prevalent are the cushioned grips. These tend to be made of foam. However, it is also quite easy to find ones that have a gel grip which is composed of silicone rubber. To a certain degree, vinyl grips are also available. Some handles have been designed to be either ergonomic or orthopedic. This simply means that they are meant for individuals who have wrist issues. These handles make it easier for those with weaker wrists to manage their walking canes. Even among quad canes, there are many different options to choose from. There are numerous manufacturers, designs, and a variety of features to select from. The first thing that you can do is to follow these steps to deciding which walking cane is best for you. More often than not, your doctor will provide you with certain specifications that you should follow when purchasing a walking cane. However, if you are simply looking for stability and do not have a medical condition, you may be a little more confused about which one to pick. 1. Handle orientation – Some basic things you should be considering are things such as handle orientation. For instance, is the cane handle suitable for both the right hand and the left hand? Some canes can be easily used by someone who is proficient with either hand. Others, however, can only be used by someone who is either right-handed or left-handed. 2. Height – Another point to consider is that the shaft can be adjusted to a height that is suitable for your individual requirements. 3. Weight – The same rule also applies to your particular weight. If there are certain medical conditions that limit the strength available in your hands or wrists, then orthopedic handles are the best. This is one of the most preferred brands and cane designs around. The NOVA Quad Cane is an incredibly lightweight cane, weighing in at just one pound. This makes it easy for individuals of all strengths to carry it around without feeling any discomfort or getting tired. The another advantage of this walking cane is that it is suitable for those of varying heights as well as weights. The cane can be adjusted to be suited for someone as little as 4’11 or as tall as 6’5. It can also take up a body mass of up to 300 pounds. The handle has an offset design and a grip that is composed of foam. It has also been designed to be incredibly safe. Each of the base feet is tipped with rubber that is slip resistant. As an added bonus, the shaft is bright and vibrant, making it very aesthetically pleasing. This artwork has been treated with components that are chip and fade resistant. If you are looking for a small based quad cane that also offers a lot of support, then the Hugo Mobility Quadpod is certainly the one. Its aluminum profile is just 1.4 pounds. This is largely due to the cane tip which is a lot more compact and lighter than most other canes in this category. This does not mean, however, that is incapable of withstanding a great deal of pressure. The Quadpod has the ability to support someone who weighs up to 300 pounds. It can also be used by those who range in heights from about 5 feet to about 6’5. There are twelve different height settings that can be used to accommodate those of all heights between this range. The final touch on this overall, superior cane is the handle. Not only is it ergonomic in nature, it is also shock absorbing. Therefore, it will prove to be quite useful when traversing across rougher or harsh terrain. The walking cane is also capable of standing upright, of its own accord. The HurryCane Quad Cane has created quite a name for itself and has quickly become one of the most preferred canes around. The base on this walking cane is quite innovative. It pivots, allowing the user to tackle more varying terrain than with other canes. In particular, it makes it easier to climb uphill. It will also support body weight up to 350 pounds. Despite this, it weighs just a little bit over a pound. There are eight different height options and the shaft can be increased from a height of about 30.5 inches to 37 inches. The HurryCane is can also stand on its own. One of the standout features on this cane, however, is that it can easily be folded up. This is quite a novel feat for quad canes and makes it really great for traveling with. There is so much that you may need to learn about walking canes. If you are looking for a quad cane, however, this article should provide you with all of the insight that you require. With this guide, you will be able to find the walking cane that is best suited to your body and your walking needs. In just a short time, you will be able to be walking around as well as before.